Tomorrow I head off to the Big Island for my annual workshop there. Not a bad gig. One of the great things about Hawaii is the fact that there is no such thing as a private beach—all beaches are open to everyone. Of course that doesn’t give tourists carte blanche to do as they please, and some locals can be pretty territorial about “their” beaches. But I’ve found that if you treat the beaches with respect (leave it as you found it, or better), honor the many areas of spiritual significance (don’t go traipsing through burial grounds and religious sites), and don’t disturb the locals (use your inside voice), most Hawaiians are quite happy to share their beautiful coast and lush rain forests. 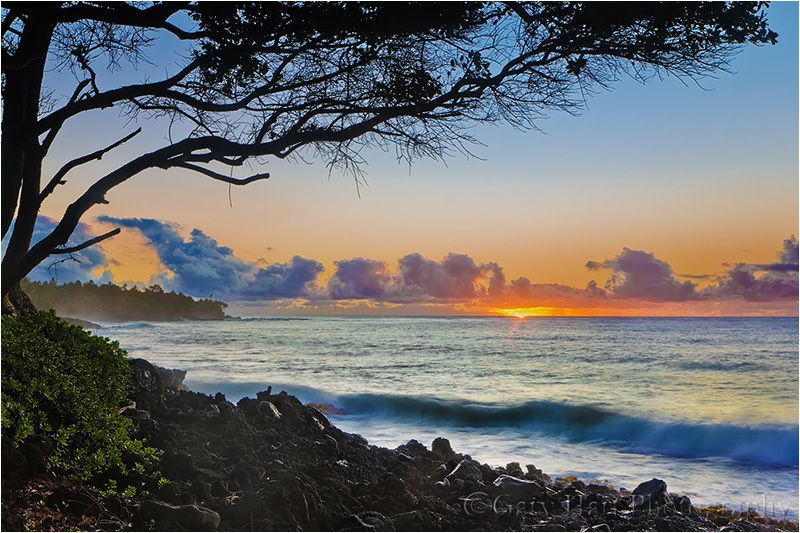 Unlike the smooth beaches and gentle surf of the Big Island’s Kona side, the Hilo side is bounded by rugged, volcanic beaches—not great for swimming, but fantastic to photograph. It’s this way because Kilauea has been in some degree of activity for many centuries, and most of this volcanic activity is focused on the Puna Coast south and west of Hilo. The result is pretty much ubiquitous black rock and sand like you see here. Driving the narrow road that follows the Puna Coast is one of my favorite things to do on the Big Island—on every visit I “discover” another hidden gem (or two) like this. I found this anonymous beach while exploring one afternoon a couple of years ago, and rose early the next morning to get out there for sunrise. Many Hawaii sunrises and sunsets have clouds all the way down to the horizon, but on this morning, much to my delight, the rising sun found its way through a gap in the clouds. One more thing I love about Hawaii? Well, there’s the ability to photograph sunrise in a tank top, shorts, and flip-flops. Can’t wait…. I really enjoy your posts, keep ’em coming!